Chandra Bahadur Dangi (30 November 1939 – 3 September 2015) (Nepali: चन्द्रबहादुर दाँगी, listen (help·info)) was the shortest man in recorded history for whom there is irrefutable evidence, measuring 54.6 cm (1 ft 9 1⁄2 in). Dangi was a primordial dwarf. He broke the record of Gul Mohammed (1957–97), whose height was 57 cm (1 ft 10 in). He came to the attention of the media when a wood contractor saw him in his village in the Dang district of Nepal. He was awarded the title of shortest adult human ever recorded after his height was measured in February 2012. He was subsequently included in the Guinness World Records. Three of his five brothers were less than 1.22 m (four feet) tall, while his two sisters and two other brothers are of average height. Dangi was born on 30 November 1939. It is unknown what medical condition limited his growth. He lived in a remote village, Reemkholi, approximately 400 kilometres (250 mi) away from Kathmandu, Nepal's capital. Before being recognised by the Guinness World Records as the world's shortest man in 2012, he had never left his home village. After being awarded the title, he said he had always wished to travel to all parts of his country and the world. He stated that being the shortest man in the world and a citizen of Nepal, he wanted to use his status to popularise his country. In 2012, at the age of 72, Dangi met the world’s shortest woman, Jyoti Amge of Nagpur, India. The pair posed together for the 57th edition of The Guinness Book of Records in 2013. On 13 November 2014, as part of Guinness World Records Day, Dangi met the world's tallest living man, Sultan Kösen, at an event in London. Chandra died in American Samoa on 3 September 2015 at the age of 75, at the Lyndon B. Johnson Tropical Medical Center in Pago Pago. His exact cause of death was not disclosed, although The Kathmandu Post reported that he had previously been suffering from pneumonia. He had been touring the South Pacific for much of the year with Samoa's Tupa'l Bruno's Magic Circus. ^ a b c अब्दुल्लाह मियाँ (26 February 2012). "७२ वषीर्य right now turning 73 in 17 days चन्द्रबहादुर बने विश्वकै होचा". अब्दुल्लाह मियाँ. ekantipur.com. Retrieved 28 February 2012. ^ a b c d "World's second shortest man: All you need to know about Chandra Bahadur Dangi". Guinness World Records. 26 February 2012. Retrieved 20 October 2017. ^ Staufenburg, Jess (5 September 2015). "World's shortest man Chandra Bahadur Dangi dies aged 75". The Independent. Retrieved 6 September 2015. ^ a b "World's shortest man, woman meet for first time". Fox News Channel. 29 August 2012. Retrieved 13 March 2013. ^ Staufenberg, Jess (5 September 2015). 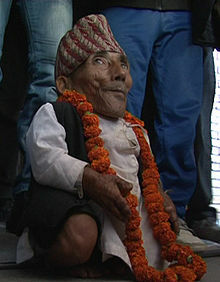 "World's shortest man Chandra Bahadur Dangi dies aged 75". The Independent. Retrieved 7 September 2015. ^ a b "World's tallest man comes eye to eye with world's smallest man for Guinness World Records' Day". The Daily Telegraph. 13 November 2014. Retrieved 16 November 2014. ^ "The World's Shortest Man Dies, a Photo Tribute to Nepal's Chandra Bahadur Dangi". The Wall Street Journal. 4 September 2015. Retrieved 4 September 2015. ^ "World's shortest man dies at 75". Daily News. New York. Retrieved 4 September 2015. ^ "World's shortest man Dangi dies in American Samoa". Business Standard. Retrieved 4 September 2015. ^ "World's shortest man Chandra Bahadur Dangi dies in American Samoa aged 75". Australian Broadcasting Corporation. Retrieved 7 September 2015. This page is based on the Wikipedia article Chandra Bahadur Dangi; it is used under the Creative Commons Attribution-ShareAlike 3.0 Unported License (CC-BY-SA). You may redistribute it, verbatim or modified, providing that you comply with the terms of the CC-BY-SA.